The Filipino citizens today celebrated the 114th anniversary of their declaration of independence. Philippine’s Independence Day marks the nation’s independence from the Spanish rule on June 12, 1898. Filipinos celebrate it annually on June 12. Independence Day in the Philippines is a day when Filipinos, including government officials, employees, and students, participate in nationwide parades. On this special day, Filipinos spend the day in parks and malls. Many Filipino communities around the world also celebrate the nation’s Independence Day. Secretary of State Hillary Clinton featured with Philippine President Benigno Aquino III (Left) taken while Secretary Clinton was speaking during her two day visit to the Philippines as a part of President Obama’s Partnership for Growth agreement which coincided with the 60th anniversary of the two nations Mutual Defense Treaty, November 17, 2011. Today, US Secretary of State Hillary Rodham Clinton sent her send best wishes to the people of the Philippines as they celebrate the anniversary of their declaration of independence this June 12th. She reports that President Obama was delighted to host President Aquino and Foreign Secretary Del Rosario last week to reaffirm this partnership. Both nations are joined together not only by their common struggle during World War II and through their Mutual Defense Treaty, but also by a deep and multifaceted partnership including robust trade, people-to-people relations, and a mutual commitment to good governance and respect for human rights. Both nations’ militaries stand shoulder-to-shoulder to ensure global peace and security in the Asia-Pacific region, respond to natural disasters, fight transnational crime, and curb the proliferation of weapons of mass destruction. Earlier this week, at the launcheon hosted by the US Department of State for President of the Republic of the Philippines Benigno S. Aquino Jr., US Secretary of State Hillary Rodham Clinton reaffirmed the US enduring friendship with the Philippines. On her remarks at DC, Secretary Clinton said the United States and the Philippines are writing a new chapter in our storied alliance and building a multifaceted relationship for the 21st century. Both countries’ trade and economic linkages continue to deepen through initiatives like the Partnership for Growth. Earlier before the lunch, Secretary del Rosario and Secretary Clinton signed a new agreement that will spur joint efforts on science and technology, because when their scientists share their ideas and their resources, not only do two countries but the world reaps the benefits. In 2011, Secretary Clinton celebrated the 60th anniversary of the Mutual Defense Treaty in Manila. 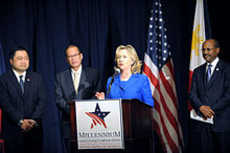 and Secretary Panetta and Secretary Clinton co-hosted their counterparts for the first time ever last April. Both nations’ special forces have been working side by side with their Filipino counterparts. Both nations are also working closely together to increase information and intelligence exchanges and coordination on maritime domain issues. As allies, the two nations consult on important regional issues, as they have done regarding their respective diplomacy in the South China Sea. The US government welcomes the initial steps to defuse tensions surrounding the Scarborough Reef taken by President Aquino. According to Secretary Clinton, the US government encourages continued diplomatic dialogue and further efforts to lessen tension, to disengage, and to resolve the situation peacefully. The United States has been consistent in that it opposes the use of force or coercion by any claimant to advance its claims, and it will continue to monitor the situation closely. At the luncheon, Secretary Clinton invited President Aquino to join her in a toast to the president and to the people of the Philippines, and to the partnership and friendship between the United States and the Philippines. On May 1st this year, in a joint statement of the United States-Philippines Ministerial Dialogue, both countries reaffirmed commitment to strengthen alliance and enhance peace, security, and prosperity in the Asia-Pacific. The joint statement between two countries stresses that the U.S.-Philippines alliance is stronger than ever, reflecting the deep and abiding ties linking two nations and forged through a history of shared sacrifice. The statement underlines that when both countries signed the Mutual Defense Treaty in 1951, both nations are united against the spread of communism. The statement also highlighted that Americans and Filipinos are inextricably bound by common values and shared aspirations, including a commitment to democracy and the rule of law, building a robust economic partnership, and deepening people-to-people ties. The US-Philippines alliance is rooted not just in a deep history of shared democratic values but in a wide range of mutual concerns. Both countries have discussed bilateral military cooperation. The United States supports a collaborative diplomatic process by all those involved for resolving the various disputes that they encounter, she stressed. Two countries’ mutual defense treaty has provided for their common defense and helped to create cooperation between their countries, not only military cooperation but also political and economic, and not only between governments but most importantly between their people. in November 2011, Secretary Clinton stood side-by-side with her Philippine counterpart Foreign Secretary Albert del Rosario aboard the USS “Fitzgerald” in Manila Bay to sign the joint Manila Declaration, commemorating the 60th anniversary of the U.S.-Philippines Mutual Defense Treaty. The Treaty remains the foundation of the bilateral relationship. The Manila Declaration also sets forth a shared vision for strategic, political, economic, and people-to-people cooperation between two nations. The U.S. government is also working closely with the Philippines to reduce poverty and increase economic prosperity. The U.S. fully supports Philippine efforts to eradicate corruption, to open economic opportunity for all, and to invest in health and education.